Albany’s Second Avenue, looking east, on Friday night. At noon Saturday, Oct. 13, that is. From 9 until 1, the Central Albany Revitalization Area (CARA) will staff a booth at the farmers’ market, and at 12 someone will cut a symbolic length of ribbon or construction tape. 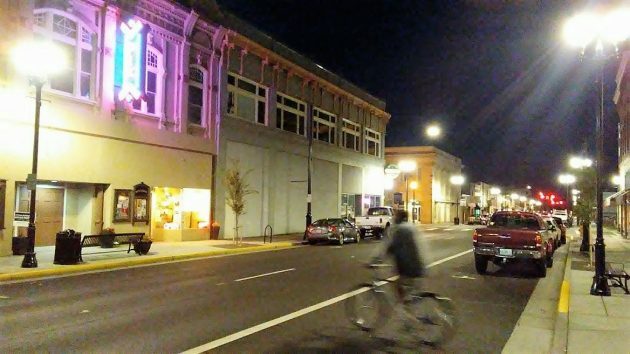 CARA, the downtown urban renewal district, funded about $8.4 million of the cost of rebuilding — during much of 2017 and ’18 — the pavement and sidewalks on several downtown streets, along with planting new trees and installing lights and street furniture such as benches, trash cans, and bike racks. The old water system under some blocks also was replaced, and this was paid for from the city’s water funds. The overall streetscape cost was estimated to be $10.6 million last May, and city officials say it has not changed significantly since. I’ve heard lots of people say the streetscape work, especially the new asphalt on five blocks of Second and Third avenues plus Lyon and Ellsworth streets, has made downtown Albany look a whole better than it did before. Myself, I’ve expressed a few quibbles about the unnecessary “catenary lights” hanging over the middle of two streets, and benches placed so that people sitting on them have a view mostly of blank walls. But I agree that overall the place looks great. It looks like the town cares about its core. 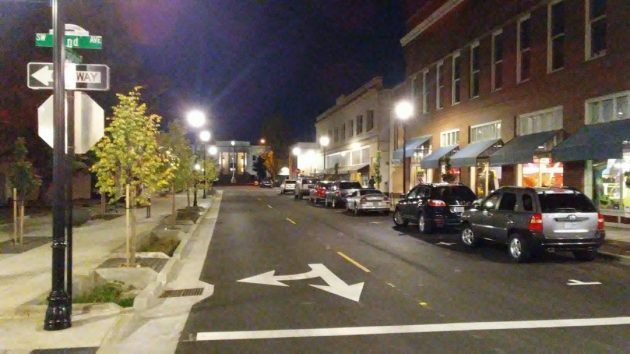 Now all we need is more people to populate the spruced-up streets, though on Friday night most of the parking spaces downtown were taken. Presumably people were inside the various restaurants and two theaters, in one for a movie, at the other for a play. The extended Boadalbin Street promenade. Two Rivers Market on the right. That will require getting new building owners. Stories of rent being doubled or even tripled out of the blue are becoming more and more common. The sites around No Rails are owned by someone that mainly works in Bend and they are charging Bend prices. Rather than get someone in, they stick to their high asking price and stay vacant. Albany also needs some sort of nightlife. The streets are dead even on the weekends after 9-10. Did you notice that the new benches have no backs? Now you can face either direction and, with the addition of he “arm rest” in the middle of the bench reaching the prone position is impossible. This is what should have been put in the first time. The City was wise installing prone-preventing benches. The lifestyle choices of the homeless should not include such deluxe housing as a full-length metal bench on a city street in January. It seems Terra Firma is the City’s preferred solution. Lyon and Ellsworth are nicely paved but why can’t they level up the manholes to the pavement? Maybe it is City engineering trying their system of speed bumps. Heavens above, where is the night sky now??!!! We can’t see it owing to the massive amount of light pollution our “city scape” generates which blocks out the stars. And the pressing need for this amount of brilliance??? Well, at least the lights might keep those trying to doze from sleeping “off the nightlife” from doing the same. You couldn’t be more wrong. LED lighting is far more “night sky” friendly than the old lighting. Good try though. Maybe you should move in with Gordon? You guys would be great (and miserable) together. Bryan…those two photo’s posted by H.H. sure look bright to me. Whether it’s LED or incandescent bright is bright. Sorry Bryan, I’m not into your “guy” thing. I will have to concur with James, Bryan, you’ve NO IDEA what you are talking about! LED is considerably less expensive to operate and lasts a hell of a lot longer, but they are BRIGHTER than incandescent lighting, period. And, I also think that the city went for straight overkill there. Those lights are so bright I thought I was at a football game or something. Wonder if they’d help keep my tan this winter?